Dubai Culture and Arts Authority has announced the opening of Al Shindagha Museum, the first phase of the ambitious Dubai Historic District (DHD) project on the Dubai Creek. Al Shindagha Museum will welcome guests every day from 10am to 6pm except for Tuesdays, when it is closed, and Fridays, when it will open from 2.30pm to 9pm. 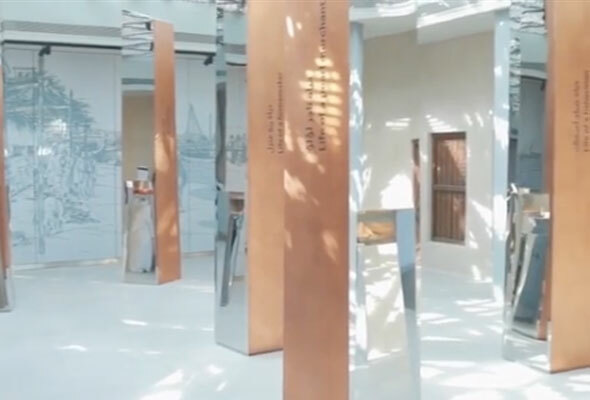 The museum, a collaboration between Dubai Culture, Dubai Municipality, and Dubai’s Department of Tourism and Commerce Marketing, promises visitors a fascinating insight into the rich past of the UAE. Described as an ‘all-encompassing venue for people interested in Emirati culture and who want to get a deeper understanding of what it entails’, Al Shindagha Museum is filled with thought-provoking exhibitions. After the welcome centre, the museum is split into several exhibition houses: Governance and Society, Creativity and Well-Being, and Living off the Land and Sea. There’s also a Children’s Pavilion and a dedicated section for education and public programming, which will regularly hold events to further promote the cultural scene, and preserve the heritage of the UAE within an exhibition hall, heritage community centre, performance centre and temporary exhibition hall. In the Governance and Society ‘houses’, expect to learn about the pioneering Al Maktoum family, the emergence of Dubai’s urban landscape from its elegant traditional buildings, and its iconic modern towers, and discover Dubai Creek, the central birthplace of the city. At Creativity and Well-being, prepare to be educated on traditional crafts of Dubai, jewellery, perfume and delve into the world of traditional Emirati remedies, and their relevance today. The third exhibition section will cover the culture of the sea, as well as what life was like on the land, and how Emirati’s would navigate the two. The children’s pavilion reinterprets themes from the rest of the museum in a way that is simple, safe, and relevant for early learners. There are both interactive exhibitions as well as traditional Emirati games inside.